Did you mean Hours instead of Minutes? My bad; 7 hrs and 26 seconds as of now! New Horizons is now less than 900 days away from it's destination! And today there is only 7 AU left to reach New Horizons' initial destination! It's takeing so long because of the 'Woosle' effect. In the fall of 2014, Ops will bring New Horizons out of hibernation. Two hundred days from Pluto, nine years after launch, the real work of New Horizons will begin as LORRI starts making images. By 90 days out from the planet, those pictures will be superior to anything obtainable from Earth, resolving features on Pluto's surface as small as a football field. Each of those images will take 12 hours to arrive from the spacecraft. Sometime in July 2015, 14 years of effort will come down to a frenzied 24 hours as New Horizons approaches Pluto at 8.6 miles per second. PEPSSI will meter plasma escaping Pluto's atmosphere and SWAP will measure the solar wind. Ralph, using less power than a nightlight, will record close-up color images. Alice will probe Pluto's atmosphere with its ultraviolet imaging spectrometer. At its closest, New Horizons will pass 6,000 miles from Pluto. As it swings around Pluto-Charon on the trajectory plotted by Yanping Guo, the spacecraft will observe occultations of both the sun and Earth, to make more measurements of the planet's atmosphere. From New Horizons' transmitter will flow all the collected data, a 3-billion-mile stream of 0s and 1s that will travel to Earth for the ensuing nine months. Ralph, using less power than a nightlight, will record close-up color images. Alice will probe Pluto's atmosphere with its ultraviolet imaging spectrometer. ...close-encounter imager named Ralph would create visible light and infrared images, as well as thermal maps of the planet, plus use a spectrometer to study Pluto's surface composition. An ultraviolet imaging spectrometer called Alice — Stern named them after Ralph and Alice Kramden, characters from the 1950s television comedy series The Honeymooners — would analyze the composition of Pluto's skimpy atmosphere. I just HAD to find out who or what Ralph and Alice are - especially as the operations manager of NewHorizons is Alice Bowman! I noticed that the round trip light time between Earth and New Horizons Is getting shorter! Must be that the Earth is moving toward Pluto faster that New Horizons is! That will go the other way once Earth's orbit turns away from where Pluto is! Shouldn't this thread read: Where New Horizons are? You're just joshing; right? New Horizons is singular! I don't believe it is meant to be plural! I wasn't the best in English with the dangling this and the modifies that! If there were 2 probes I would have used are! neufer wrote: What, me josh? OK! I can see clearly now; I mispelled New Horizons! <<Back in 2005 and 2006, when Pluto’s second and third moons (Nix and Hydra) were discovered, searches by astronomers for still more moons didn’t reveal any. So the accidental discovery of Pluto’s fourth moon by the Hubble Space Telescope in mid-2011 (during a search for Plutonian rings) raised the possibility that the hazards in the Pluto system might be greater than previously anticipated. Those concerns were amplified when Hubble discovered a fifth moon in 2012. As a result of those discoveries, the New Horizons science and operations teams began to more carefully scrutinize the true level of hazards to our spacecraft at closest approach and devise mitigation strategies to make sure the encounter with Pluto would be successful. 1) The Pluto system appears to be far safer than early fears and initial calculations indicated when the new moons began popping up. In fact, the best current models predict a 0.3% (1-in-300) chance of a mission-ending impact near closest approach on the nominal trajectory. Much of the reason for this lowered risk assessment is that more sophisticated dust-impact models revealed a decrease (by about a factor of 100) in lethal impact probability for trajectories that fly into the region where New Horizons is aimed now – a region where the gravitational effects of Pluto’s largest moon Charon clear debris. Another important factor is that when we tested spacecraft components against high-velocity impacts using gun ranges in New Mexico and Ohio, we found the spacecraft shielding is considerably “harder”– that is, more resistant to impacts – than preflight estimates indicated. 2) The baselined New Horizons closest-approach aim point is one of the safest possible aim points – if not the safest aim point – in the Pluto system. This is because we’re headed to a closest approach in the region that Pluto’s Texas-sized moon Charon efficiently clears of debris. In fact, Charon offers such a good hazard-removal service that even if a recent impact onto a small moon created debris near Charon’s orbit just months before encounter, Charon would clear almost all of it by the time the spacecraft arrives. These backup encounter sequence plans are called SHBOTs, an acronym for Safe Haven By Other Trajectory. Our first SHBOT is called GIS, for Generic Inner SHBOT. It continues on the nominal trajectory and aim point, but for three hours near closest approach, we repoint the spacecraft so its dish antenna can shield it from impacts. This pointing attitude, called Antenna to Ram (or ATR), would cost us some science because we won’t be as free to point the science instruments toward Pluto system targets during those three hours. But tests and modeling show this provides a factor of three to four times increase in success probability, and reduces the estimated loss of mission probability to about 1 in 1,000. Our second SHBOT is called DIS, for Deep Inner SHBOT. DIS also uses the ATR attitude. It also directs the spacecraft toward a much closer encounter with Pluto – just inside 3,000 kilometers from Pluto’s surface, compared to the nominal encounter close approach of about 12,500 kilometers from the surface. Why go closer, not farther, to avoid hazards? Because if we go close enough, we can benefit from the fortuitous “drag clearing” of debris particles from Pluto’s extended upper atmosphere! DIS has more severe science impacts than does GIS, but there is a strong consensus among the team that it’s both the best choice if late-breaking news tells us the nominal trajectory is unexpectedly riskier than we’re comfortable with, and losing some science to execute Deep Inner SHBOT is far better than losing the mission to a lethal impact. Before I close this column out, I also want to update you on mission status and other project news. Currently, New Horizons itself is about 2.6 billion miles from the Sun, and only about 600 million miles from Pluto. Arrival at Pluto is just under 700 days away – still a long time, but much less than the nearly 2,700 days we’ve been traveling since launch! New Horizons is healthy and on course, with all systems and science sensors working. On May 21, we’ll wake the spacecraft from its most recent, 100-plus day hibernation to begin a busy annual checkout, which will include thorough checks of all backup systems, instrument payload calibrations, and an update of our fault protection software with the next-to-last planned set of enhancements before we start the Pluto encounter in January 2015 – just over 19 months from now. This summer’s wakeup will also include our most comprehensive on-the-spacecraft close-encounter rehearsal. For nine days, beginning July 5, New Horizons will execute all the activities of its final week on approach to Pluto, closest approach day, and then some of the post-encounter timeline as well. This rehearsal follows up on our successful encounter-day practice from last summer. 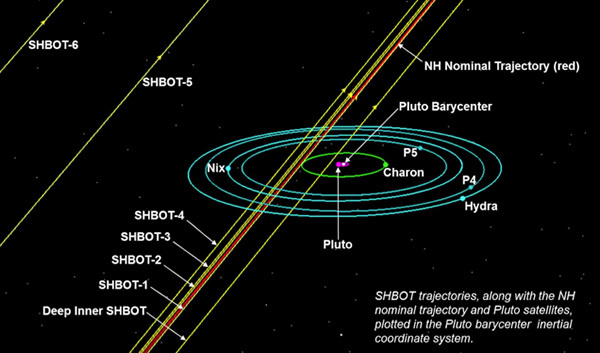 After the nine-day rehearsal, we’ll downlink a large amount of data through NASA’s Deep Space Network to evaluate how the rehearsal went, collect more cruise science data, conduct more spacecraft navigation tracking, and then put New Horizons back into hibernation on August 21 for another 4½ months, while the team works on SHBOT encounter sequencing. I hope New Horizons is packing enough dog food to make Pluto and it's pups friendly towards it. Arrival at Pluto is just under 700 days away – still a long time, but much less than the nearly 2,700 days we’ve been traveling since launch! I think it should read just under 800 days! So true! I'm already anticipating when pictures start coming!